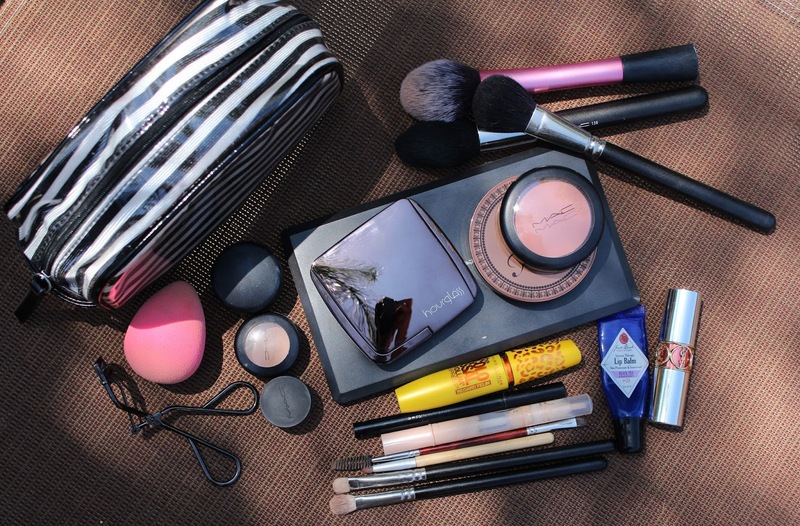 My make-up bag is from Forever 21, which I find has the cutest make-up pouches! They always have to have them displayed while you're in the line, and I can never resist. This one has a cute black and white striped design and has the perfect shape. With the exception of the palette, it fits everything in there with minimal brush smushing. For face, I brought a sample of MAC's Face and Body foundation. I am a firm believer in sampling out foundations before purchasing, and I have recently been testing out this one. They really give you a generous sample and this one lasted me a little over a week of use. 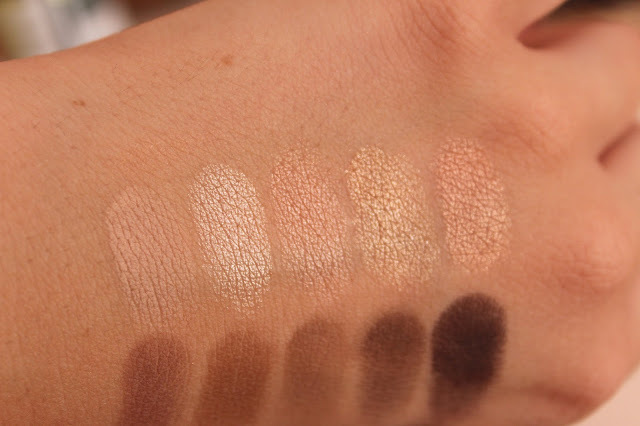 As for my opinions on it so far, it is very light coverage and leaves your skin with a dewy glow. I think this is a great foundation for summer because it looks so natural on the skin, but stay away from it if you have oily skin or need fuller coverage. To cover spots, I brought my MAC Studio Finish concealer and for underneath the eyes, I brought the Maybelline Dream Lumi Touch concealer. For powder I brought the Hourglass Ambient Light Powder in the shade Diffused Light. I am still testing this out, but I brought this along because it gets rid of the shine, but still keeps the skin looking completely natural. Of course, I had to bring my favorite bronzer ever, which is my Too Faced Chocolate Soleil bronzer in the shade Milk Chocolate. This bronzer is perfect for my skin tone and I love the fact that it's matte...and smells like chocolate. For blush, I brought Immortal Flower by MAC for the perfect light peach flush. As for eyes, I had to bring my MAC palette because I do not have any smaller form of carrying around my eyeshadows. I need to invest in a quad from MAC because carrying around the whole palette, when I really only need a couple shades, is not practical for travel. For primer, I brought my MAC paint pot in the shade Rubenesque. This is one of my favorite products for summer because it is a beautiful shade on its own or under other eyeshadows and it doesn't budge. As for eyeliner and mascara, I stuck with my favorites, which are the Maybelline Colossal Cat Eye's mascara and the Stila Stay All Day Liquid Eyeliner (spot feature on this coming very soon). My Shiseido eyelash curler had to come along as well. For lips, I stuck with the essentials. 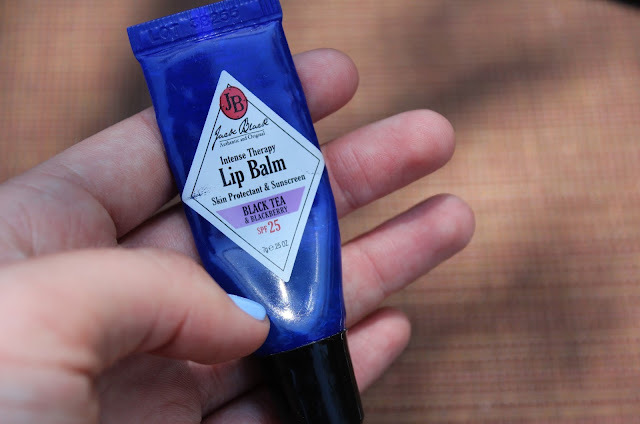 I brought my absolute favorite Jack Black lip balm with much needed SPF! The Black Tea & Blackberry flavor (or scent?) is my favorite. For a little bit of color and moisture, I brought the YSL Volupte Sheer Candy in shade two, which I believe is named "Juicy Papaya". I will keep this short and just list the brushes I brought. For face, I brought my beauty blender, MAC 138 & 116, and my Real Techniques Blush Brush, which is my favorite brush for bronzer. For eyes, I brought the MAC 217 & 239. I honestly could have done fine with just the 217 because I didn't do any extensive eyeshadow looks. I also brought along my eyebrow spoolie/brush combo and my eco tools detail brush specifically for that inner corner highlight. This post is titled "On The Desert Plains" because those are some lyrics from one of my favorite songs right now, and perhaps the unofficial anthem of my trip, Song For Zula by Phosphorescent. 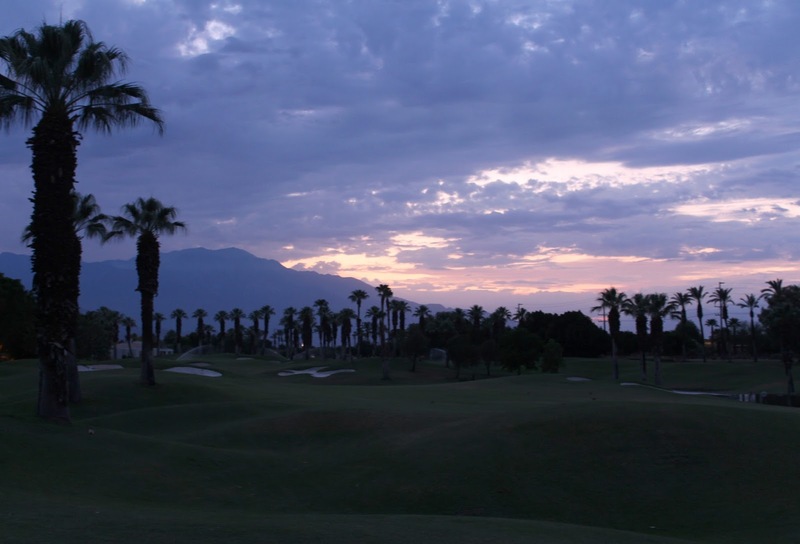 Anyways, I just got home from a couple day stay in Palm Springs. I have been going there with my family for as long as I can remember, and it's always nice relaxing by the pool all day. I am quite used to the heat, but even in the evenings the temperature is still near triple digits. For this type of weather, the crop top and skirt combo was necessary. I guess Brandy Melville has mastered the tight, crop top designs that are all the rage among southern california teenagers, myself being one of them. They just seem to go with everything! The skirt is from Nordstroms, and the bag and shoes you have seen before. I love turquoise accessories, especially in the summer. My wrap bracelet is from a vendor in Venice Beach and my ring is from an Indian reservation in Arizona. It is my absolute favorite! On my lips is my most loved bold lipstick, Vegas Volt by MAC. Ohh MAC eyeshadows, how I covet thee. My collection of MAC eyeshadows has grown rather large in the past few years. When I say large, I mean moderate in size for the average beauty collector, but outrageous in size for the normal girl. 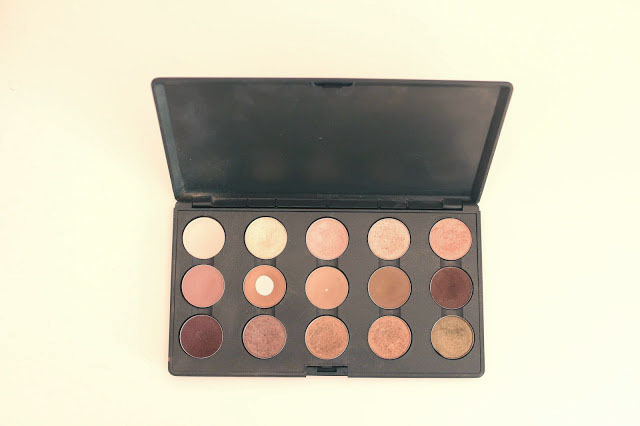 I thought I would do a post of this specific palette because it is my most used, "every day" palette. The top row of my palette features the light highlight or "all over lid" colors. In order from left to right is blanc type, nylon, naked lunch, retrospeck, and all that glitters. 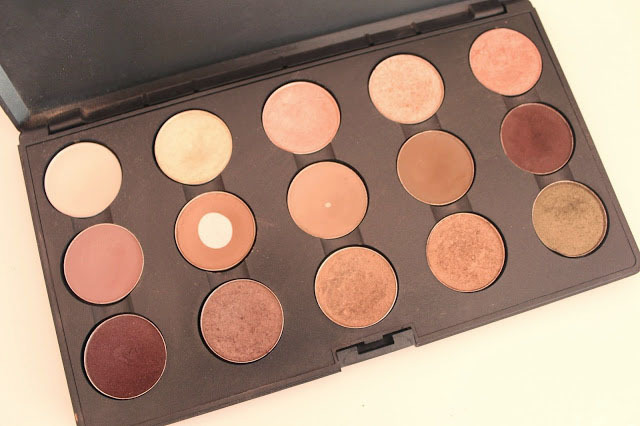 The middle row entirely consists of matte neutral shades, perfect for contouring your crease or filling in eyebrows. Again from left to right is quarry, wedge, omega, charcoal brown, and embark. 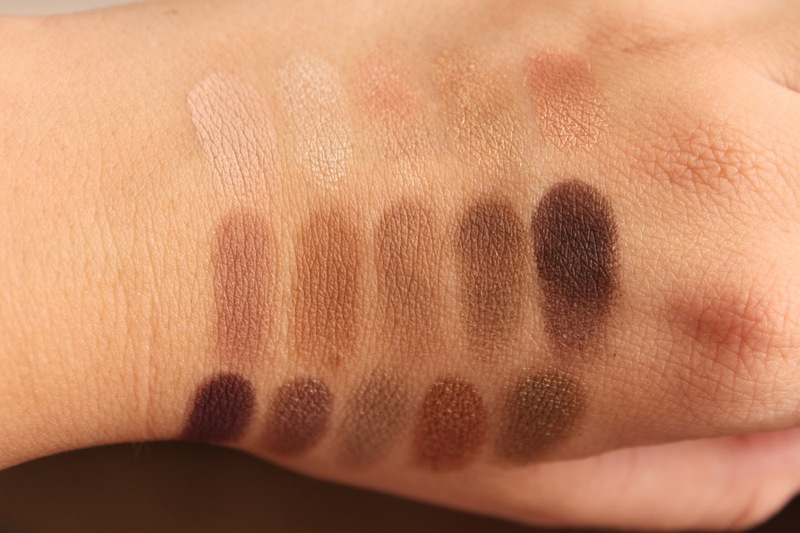 The bottom row is a little more fun, filled with darker shades that really make a look. In order is sketch, satin taupe, patina, woodwinked, and sumptuous olive. This color is a matte, almost white color. Blanc Type recently replaced Brule in this exact spot. The two colors are almost identical, Blanc Type just has a more opaque, buttery texture. This kind of color is so multifunctional, and, in my opinion, is a must have in any palette. Just tapping your blending brush in a shade like this, instantly helps clean up any harsh line. This is also my go to highlight color; I much prefer a matte highlight opposed to a shade with shimmer. I also use this is I want a clean lid color, I prefer Blanc Type opposed to Brule for this reason because the pigmentation is better. It instantly brightens your eye and covers any discoloration or veining. This color is a pale yellow gold with a very high frost finish. Because the finish is so reflective, almost metallic, I only use it as an inner corner highlight. The color is too frosty for an all over lid shade or a brow bone highlight. Even though I only use this shade for one sole purpose, is does one hell of a job. It instantly opens your eyes and draws attention to that area. I will be the first person to say it, but I do not understand the hype around this particular shade. Dare I say it, this is actually my least favorite shade in my palette. Naked Lunch is your basic, pale, pink toned, all over lid or highlight shade. A million brands have colors similar to Naked Lunch with even better textures. The finish of this eyeshadow is a frost, which is not MAC's best eyeshadow consistency. However, I do think this kind of shade is necessary in anyone's collection. Like I said, it's the perfect, "don't have to think about it", all over lid color or more subdued highlight. This color is another pale gold, beautiful all over lid color. This color is a little underrated and perhaps gets over looked due to its Lustre finish. This finish is the most disliked MAC finish because most of the Lustre eyeshadows are poorly pigmented and have a gritty texture. Although the texture of this eyeshadow is not the best, the color is pretty unique, in my opinion, and has good pigmentation. This color, I know you have heard of. All That Glitters is the perfect, peachy toned light gold shade that blends seamlessly all over the lid. Because it is a warmer shade, I find it looks best with warm browns and bronzes. The finish on this shade is a veluxe pearl, meaning it has a buttery texture and opaque pigmentation. I think this shade truly does deserve the hype it gets. This is one of my favorite colors and most used. I would describe this one as a matte light taupe color... kind of purple, kind of brown, kind of grey. This is one of my favorite crease colors to use, and I love pairing this with a color like Blanc Type on the lid. I'd say you see its full potential on fairer skin tones but it is still pigmented enough to show up on darker skin tones. 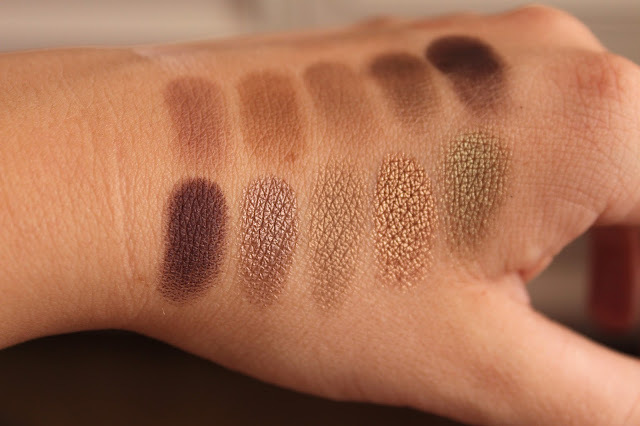 This is your basic, warm toned, matte neutral brown. This is, again, an essential in any palette. It pairs perfectly with almost any lid color and helps blend out a darker smokey eye. Another one of my most used, Omega is an ashy, medium toned brown shade. Because this is more of an ashy brown, it is the perfect brow shade for light skin tones or blondes. I would say this is one of the most popular colors from MAC used for filling in brows just because it seems to work for everyone. If you are looking for a bolder brow, I would use the next color I am going to talk about. This color goes hand in hand with Omega. It is basically a darker Omega, a darker ashy brown. If you have a darker skin tone or dark hair, I would recommend this one as a brow shade. Even for fairer skin tones, I sometimes mix this shade with Omega to get a bolder brow. This also works nicely for contouring your crease. Because of its ashy tone, it pairs well with almost any lid color. Embark is a well pigmented, red toned brown shade. It works great as a crease color or a matte outer corner shade. You could also use this as a softer eyeliner or use it to shade the lower lash line. Being another one of my all time favorites, Sketch is a dark almost burgundy brown. It has subtle red shimmer in it that is almost non-existent once applied. I love this color paired with any taupe shade. I mostly use it in the outer corner for a purple-toned smokey eye, but this would be great as a crease color for a darker look. I think you can see a trend with me loving taupe shades, but this is another one of my favorite colors ever. 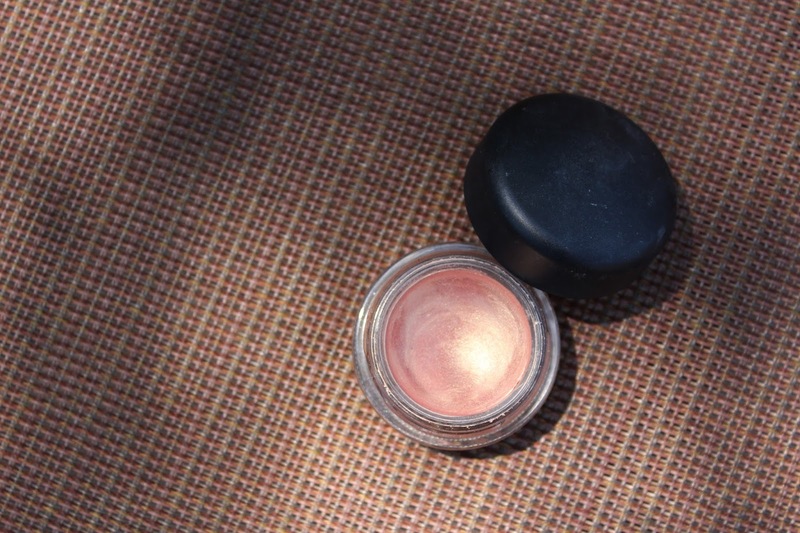 This is a veluxe pearl eyeshadow, meaning the texture and pigmentation of this color is perfect. This is my favorite crease color to use that has shimmer and pairs perfectly with pink-toned lid colors. I guess I like to group my favorites together because this is another one of my most used colors. In fact, this is my second pan of this eyeshadow. Patina is a very unique color in my opinion; I would describe it as a medium gold shade. However, I would say this has more green in it opposed to yellow. With my fair skin tone, the "green" golds look best, and the versatility of this shade is endless. I love it as a lid color, a subtle crease shade, and it goes with so many other colors. I also love this shade because of the finish, it isn't too frosty or reflective. This is a color I don't use on myself too often, but I still absolutely love. Woodwinked is a very warm toned, highly reflective bronze shade. Although, with my fair skin tone, it just doesn't look the best on me. When I blend it out at my crease, it goes a bit orange, which is not the kind of look I particularly love. But on people with warmer skin tones, this looks amazing! For me, I like to use this for a bronze smokey eye. I pack it onto my lid and then blend a different color in my crease to avoid the orange effect. My friend and I like to describe this color as "camo for your eyelid". It is absolutely beautiful and I love it with my hazel eyes! I would say this is an olive-y brown shade. I like it best packed onto the eyelid but it also looks great as a crease color. I definitely think this shade is unique and works as a great color to wear in the fall time! ...well that was a lot to write. I give you props if you read my description of all 15 eyeshadows. But there you have it, my most used palette filled with my favorite MAC eyeshadows. I would like to add that MAC has recently brought out a new palette system and the one I have is not available anymore. I just have not felt the need to buy the new one yet!